Brent Heighton’s watercolours, acrylics and oils have been well received by many corporate and private collectors in over 30 countries of the world. Brent has had exhibitions in New York, Tokyo, Germany, Belgium, Holland, many parts of the U.S.and most recently Mexico. 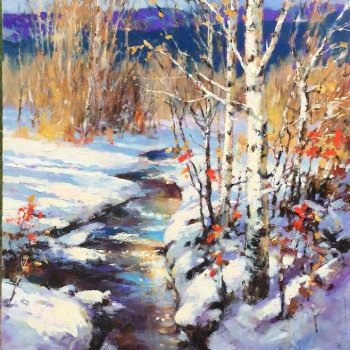 Brent Heighton has been painting for over 30 years full time. After college Brent began a brief career in the commercial art field. Not satisfied with the deadlines, the rush jobs, and working out other peoples ideas as to how they wanted things to look, he realized that as difficult as working in the Fine Arts was, becoming a painter of what you want and not what someone else wants, was the most important and satisfying. He has never looked back on or regretted taking that chance. Working as a full time Artist has allowed Brent to travel all over the world in search of ideas and things to paint. Brent has traveled with his family to Europe, spending time in France, Holland, Belgium, and as far south as Greece. All the time with paints and brushes in hand, always looking for that inspiration just around the corner. The difference of light in a place like Greece compared to Cornwall, England is very exciting says Brent. Brent and his wife Elizabeth, winter in their home in Mexico. The architecture, the people, and the light keep enticing Brent back there, “I find Mexico helps my creative juices start to flow when I’m there and I love the color of the light.” says Brent.